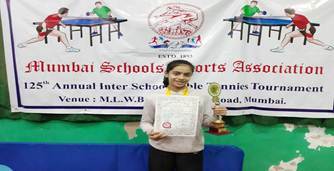 We are delighted to share the achievement of Ms. Ananya Chande of AVM Bandra West, Std.VII in the MSSA Inter-school Table Tennis tournament held in Mumbai from 23rd to 25th January 2019 . She secured first position, Gold Medal and a trophy in the Girls Under 14 girls category. Congratulations to Ananya. Best Wishes for the forthcoming tournaments.